Why I May Still be Canadian | Writers Speak Out! David Lloyd is the brilliant founder of ETNI, a website offering vital information and outreach to English teachers in Israel and worldwide. 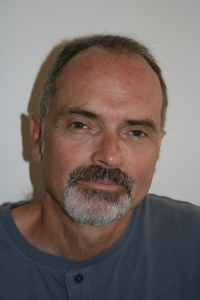 He founded the Etni Rag, an ezine for English teacher-writers, and has created a marvellous mailing list that offers opportunities for teachers to grow in mutual deliberation, question and support. 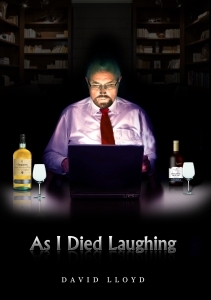 With his latest novel, “As I Died Laughing”, he has emerged as a writer of fiction. His blog “Why I May Still Be Canadian”, also offers an opportunity to see his other sides. He graciously agreed to be interviewed for Writers Speak Out! J: (haunted!) Do you have a special place or time for writing? David: Most of my writing is usually done on the weekends. I find it difficult to deal with the creative urge after long tiring work days. The best time for my writing is early morning, Friday and Saturday, stretching into the afternoon. David: I began writing as a child: notes and poems for family members, mostly for my mother on special occasions (birthdays, Mother’s Day, etc.). But my writing really began to take shape at the age of about fourteen when I began writing to a pen-pal (long before the days of Internet). This was to a girl who I had known in elementary school and who had moved away with her parents. Her father visited one day and told us she was lonely and I decided to write her. She tells me that she still has my letters, which she treasures, and we are still the best of friends despite living on opposite sides of the globe. Later in my teen years, I began to carry around a notebook with me in which I would write down all types of observations and ideas. David: Music has always been a strong part of my life. Music is also an exploration into words, especially crafted in melody. When first on the kibbutz, at around the age of 19, a friend of mine and I held musical evenings where we played the guitar and sang: usually folk songs, Leonard Cohen being our favorite. Even earlier than that, I used to sit with the librettos of French operas, as a way of improving my French. In doing so, I became aware of the subtle nuances of words in this art form. J: Do you get inspired by any particular writer or other form of artist (musician, dancer, painter, actor, etc)? David: I am inspired by anything which reaches in and touches my inner core. My early inspirations were Leonard Cohen and Bob Dylan. Lately I feel inspired by Damien Rice and Maya Isacowitz, among many others. I love the way the Internet has opened up the world of music, allowing me to discover many different musical artists and musical genres. 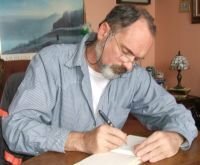 In the writing world, I have been inspired by many writers in the past: James Joyce, John Fowles, Kurt Vonnegut – anyone with a unique vision. I am inspired by actors who touch upon human complexity. This doesn’t only depend on the actor but also on the part they are given and the direction of the director. Recently I have been inspired by a very long biography of Mordechai Richler. Inspired by how difficult and strange, at times, his experience was as an author. Nothing is black and white and it is always good to be reminded of this. David: I often claim that I have nine different personalities locked inside of me, each struggling to be heard. I can hear the words in my head, when visualizing something new, especially when conceiving of a new blog entry for my blog: “Why I May Still be Canadian”. The words are suddenly heard, triggered by many little things. And when I write – whatever it may be: a novel, a blog, a letter… – I go back over what I have written a number of times, hearing it in my head, fine tuning it until it sounds just right. David: The writing of John Fowles and James Joyce have had an effect on me. Fowles took liberties, introducing the author as a character in the book, offering alternate endings, playing with a story within a story. Joyce broke away from chronological order of things into the “streams of consciousness”. My book might be said to mirror some of these things in many fragmented ways. Other literary influences may be much more subtle, as I read extensively in my teens, about two books a week. I read much less fiction now, partly because I do so much reading of a different sort on the computer during the day and spend much of my free time writing. J: And who are your favourite writers? David: That is difficult to say. I enjoy so many writers from so many different genres. Kurt Vonnegut, Douglas Adams, John Fowles, James Joyce, Mordecai Richler, Tolstoy, Dostoyevsky, Dickens, Tolkien, Asimov, Frank McCourt… the list goes on and on. David: There are times, when something is really burning a hole in my brain and I just have to get it down. But usually I am just too worn out to write, especially on days when I spend most of my time in front of a computer screen. Lately I have been working on 1,000 to 2,000 piece puzzles in the evenings to relax and help organize my thoughts after long work days. David: It depends on what I am writing. I may write two blog entries in the same week, or only one blog entry the entire month. I don’t sit down and consciously tell myself that I will now write a new blog entry. Usually something comes to me, triggered by something that I have experienced, heard or read during the day. I will play it over in my head and then sit down and write. I usually never finish it, though, in one sitting. In writing a novel, I jump from place to place. I may write a new chapter that suddenly appears in my mind, with no idea as to how this will fit into the whole. And later I will piece things together. Usually the way things fit make natural sense, as if I had carefully planned this out beforehand. When continuing to write, I go back again and again to what I have already written, to hear how it now sounds. Sometimes I will throw out an earlier written chapter. At other times I will make significant revisions, or move the chapter to a completely different section of the book. David: Definitely. It keeps me sane, while also pushing me towards the edge. It allows me to converse with my inner self. I think our biggest defence mechanism is “denial”. Denial allows us to ignore parts of ourselves and the world around us. Writing forces us to come face to face with our inner demon. David: Definitely. Especially in my blog, where I often strip naked and expose myself on many very personal issues. People often ask me why I do so. I guess it is a balance between keeping to my closed self in day to day life (I do not open up much verbally with most of the people around me) and revealing my inner self through my writing. I think I am exposed more in my blog than in my novel, for in my novel I can still hide behind the fact that people can never be sure which part is fiction and which part is based on my real experience. J: Have you studied writing in a formal academic setting? Or if not, how have you worked on your craft? David: No, I haven’t. I write and rewrite and constantly learn through the process. Once, when I was just starting out on my novel, I read somewhere that writing is ten percent creation and ninety per cent rewriting. I have discovered how true this is. The rewriting process has become my best teacher. David: No. Like most things, I am pretty much out there doing it on my own. J: Are you involved in the internet writing scene such as writers’ forums? David: After publishing my book, I tried to become involved more in writers’ and readers’ forums such as Goodreads, but I find it difficult to keep up with this. J: Would you consider ‘mentoring’ a good young writer? I mean, offering critique, praise, encouragement. David: In a way, I suppose I already do this through another blog that I started: “The Virtual Muser eBook Review” – in which I review eBooks written by new writers, in the hope that this will help them become a little better known and provide a critique that will hopefully help them as a writer. How do you feel about getting political in your writing? David: I am not interested in getting political. My writing may touch on political topics as a natural outgrowth of the development of plot and character. But this is not meant to be a political statement but rather an exploration of the worlds which surround and shape us. By becoming overtly political, we put a stamp on our forehead and ostracize a significant part of the population that might otherwise identify with much of the book. David: This is something that I have weighed quite a bit in my mind. Would I consider myself as an Israeli writer or a Canadian writer, or both? My formative years, as a child and a youth, were spent in Canada. Almost all of my adult life has been spent in Israel. I don’t think I can claim to be an Israeli writer, as I write in English and much of my worldly outlook has been shaped in my formative years. Yet, how can I consider myself a Canadian writer when removed from the Canadian scene for so long? I guess I am somewhat of an orphan when it comes to writing. David: I was very ambitious in writing this book, in its fragmented structure and how all is led towards creating a complex mosaic. When coming out with the book, I wasn’t sure if anyone would get it – or if it were possible of being “gotten”. Thus comments by those who did “get” the book, were very important to me. This doesn’t mean that they all understood it in the same way, but that at least they weren’t left scratching their heads in total confusion. J: Can you offer some background to your latest novel: As I Died Laughing. J: How was the idea of the novel born? David: The idea was born from my vast and varied experience with virtual worlds. I first became involved with the Internet in the early 1990’s, mainly through innovative uses of the Internet for education. I became more and more aware of the power of the written word, and how virtual worlds allowed people to “reinvent” themselves. What struck me most was the fine line between so-called “reality” and “fiction”. “As I Died Laughing” was born out of all of this. David: I thought that this was a compelling story waiting to be told. Something that many people could identify with in this digital age. So I decided to make it into a novel. As soon as I began writing, things started to take shape. At first, my concept was encased in a rather simple and conventional structure. But as I went along, I realized that that the structure was as much a part of the story as everything else. It was then that I began to rework the whole structure of the novel and add parts which I had originally planned to be a part of a second novel, as I discovered how well they fit together. David: By the time I started writing the novel, my three children were mostly grown up, and needed me much less. Perhaps this is one of the reasons why I began writing a novel only quite late in life, when the children were beginning to leave home for their own unique life experiences. J: Do you have a favourite passage? Could you offer it here? “He didn’t know how long he had been out. He was awakened by the tapping of fingers. He raised his head and saw that they were his own fingers. The tapping grew louder and the ticking softened, until it almost disappeared. Looking up at the clock, it appeared that time had stopped. But it was only an illusion. Nothing was real. Nothing could be at that moment. The words hung above him on the screen, useless, without his divine intervention. Guy was waiting. His creation, created in his own image and likeness. Waiting for the breath of life, which could only be when he had dotted the final ‘i’. Crossed the final ‘t’. He pulled himself up and sank back into the chair. All around him was black. There was only one way forward. The light from the screen beckoned. But the words were blurred. Eighteen years. Ended before it had begun. The ticking had stopped. He could turn back time now. Or at least cheat a little. A time warp, an invention of another world. She was waiting. Michael leaned forward and reached for the glass of whiskey. He didn’t remember pouring the drink. Or raising the glass. Not until he felt it bite into the back of his throat. He could see the words clearly then. Dancing in front of him. Taunting, celebrating the moment, daring him to go back. He set the glass down on the table, his hand unsteady. David: That is a very good question. Another book has been brewing in my consciousness, but after continually hearing from people that my first book would make a great movie, I have been working – this past year – on a screenplay for the book and am almost finished. David: Thanks Judih for giving me this chance to talk about my writing.